Laundromat Art Space is the best novel contemporary art studio in Miami since last May. It is the ideal place for Artist Residency Program where the mid-career Miami artists can host their art exhibitions in the heart of downtown Little Haiti. Its 4500 square foot space houses one art gallery and nine studios where nine resident artists can create anything within their domain from sculpture to paint or photography, textile, printmaking and beyond. The studio will regularly organize community programs and contemporary art exhibitions. The center fosters collaboration between multidisciplinary creativities under the shadow of own Caribbean Culture that defines Little Haiti. Enriching a community culture through art while maintaining its distinct characteristics, can sometimes be a challenge. The art center is presented by a Miami based non- profit organization 'The Rise Up Gallery" that provided low cost art training workshop to the community. David McCauley is the executive director of Rise Up Gallery, the nonprofit group behind Laundromat. Out of 11,000 applicants, Laundromat happens to be one of 71 finalists in the 2015 Knight Arts Challenge Grant. North Ministry of Tourism in Haiti has been busy with construction projects to attract more tourism to the region. Several projects are ongoing, and more are planned to begin soon. Royal Caribbean Cruise Line's (RCCL) Vice President, Frank Byrne, led a two-day tour to view progress being made on projects in Cap-Haitien, Milot, and the Bay of Acul du Nord. The initial stop was Cap-Haitien, where a craft market is being built for the tourist trade. Next was Milot where several projects to improve tourism infrastructure are nearing completion. A craft market is being built, as well as public toilets, a health clinic, restaurant, and information kiosks. The group also surveyed Sans-Souci Palace and Citadelle la Ferriere sites. Following, Byrne met with the press to share news a push is happening to lure eco-tourists to the North region for biking events. Dieudonne Etienne, North Regional Director of the Ministry of Tourism, announced a police sub-station to be built in Milot for the comfort and safety of tourists. 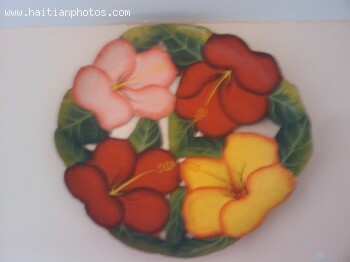 Since its inception in the late 1970's the National Handicrafts Office (ONART) has been under the supervision of many different bodies, predominantly the Ministry of Social Affairs and Labor, but also the Ministry of Commerce and Industry, the ONAAC and the Ministry of Agriculture and Rural Development. Regardless of who had the mandate of overseeing ONART, the aim has always been to provide a resource for professional artisans where they get advice on finance, preparation and the technical aspects of their craft. On top of that, ONART acts as the glue between individuals, corporations and associates, bringing operators together with producers. Today, ONART steps into the present trend towards innovative and modern ideas and has started to use the NTIC format (New Technologies of Information and Communication, for the gathering and publishing of news to their client base across Haiti. It is, perhaps, an artists' mandate to create emotive, moving pieces from the most unlikely materials. Some make it their point of duty to turn every-day, nondescript objects into riveting pieces. 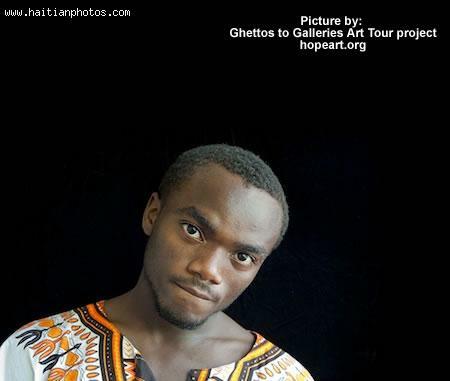 Romel Jean Pierre is one Haitian artist that would take this a step further. Educated in art by the colorful streets of his home-town Port-au-Prince, Haitian artist Romel Jean Pierre is only 19 years old, but uses his gift to turn things as mundane as old car parts and broken down furniture into sculptures fashioned into abstract pieces of art which speak to the materialistic nature of society today. Haiti's Carnival of Flowers, being held for the second year running, is an expensive event for the government of Haiti to subsidize. Controversy it has posted a loss rather than a profit--as the GOH claims--has had calls from activists to stop holding it. One solution helping defray costs is a group of entrepreneurs, who create Carnival costumes out of garbage: flowers, hats, and dresses. 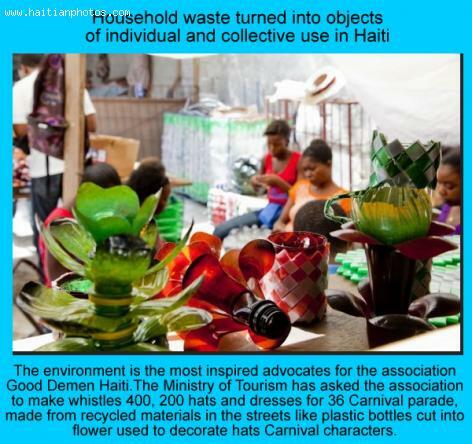 Haitian teens, part of Good Demen Haiti (GDH), are making flowers to adorn carnival hats, both made from recycled materials. The members of the organization, at-risk youth, use plastic bottles delivered from waste collection centers in Port-au-Prince by garbage collectors. After thoroughly sanitizing the plastic containers the members work creating innovative art objects. 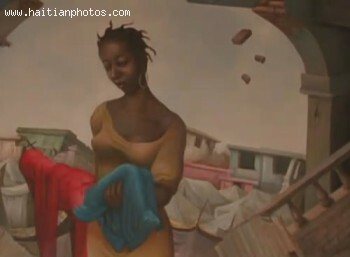 299 pieces of Haitian art, done by renowned artists, are on display on the pages of the Electronic Gallery. Efficiently displayed, pieces by your favorite artist, using the Artist Locator, or a specific theme, like Vodou flags, can be easily located and reasonably obtained. With its roots from Africa and France, Haitian art is grounded in tribal and religious influences like Catholicism, and, of course, Vodou. Different schools of artistry quickly developed, distinguished by the symbolism and subjects. Daily city life is indicative of the school Cap-Haïtien, while the human body in abstract comes from the Vodou-influenced Saint-Soleil School and mountain scene and coastal town depictions are associated with the Jacmel School. Another style of art that has gained popularity is from the Artibonite region. It had its start with Saincilus Ismaël, whose influence was Byzantine art. His use of geometric shapes to create vividly intricate paintings would catch on to other artists. Indigo arts gallery is the home of international folk and modern art. Indigo prides in exhibition of varied color, texture, and the unlimited creativity of the human spirit. Their pieces originate from works of art collected from all over Africa, Asia and the Americas. Indigo features unique Haitian paintings, Prints and paintings with a Mexican origin, Sculpture and vodou flags. Other dominant characteristics include; Nicaraguan "primitivista" paintings, folk paintings with an Indian touch, Cuban self-taught artists, African signboards and Oceanic sculpture. Indigo gallery is also in the business of publishing Indigo Art Cards that have the popular modern art features from across the world. Galerie Marassa, established in 1977, is a leading galleria of the Caribbean. It is located in Petion-Ville, Haiti and has acquired global recognition since its birth. Galerie Marassa has created a home for nurturing new Haitian art talents. In its history the galleria has organized hundreds of national and international exhibitions as well as art fairs and biennales. Michele Gardere Frisch is the name behind Galeria Marassa. Michelle opened the facility after completing her artistic studies at The New England School of Art and the school of decorated arts in Madrid. From the two institutions, Michelle had acquired a degree in Art and Design of the environment.